Light, beautiful open solution apartment. Fully furnished, fully equipped kitchen. Large twin bed in the bedroom 180cm, sofa bed in the living room and another 2 extra beds or cots. Up to 5 is duable in the apartment but it's best suited for 2-4 persons. Please note that there is no door between the living room and bedroom but it's well secluded anyway. I'll arrange a baby cot for children up to 2 years. Cozy old town, great location, close to everything and lovely atmosphere. Absolutely the best location in Stockholm, making sure you will have a great vacation. Hvis du er en større bedrift, vennligst kontakt meg da jeg kan være i stand til å arrangere for en anden lejlighed i samme bygning. Small bathroom as in all old town houses but toilet and shower inside. Lovely little flat on 3rd floor of old town house. I highly recommend this light, comfortable, very convenient flat. Essentially 3 rooms and shower room, up 3 flights of stairs. It would be noisy at night if you had to keep the windows open in a heatwave -the narrow streets of the Old Town amplify noise. 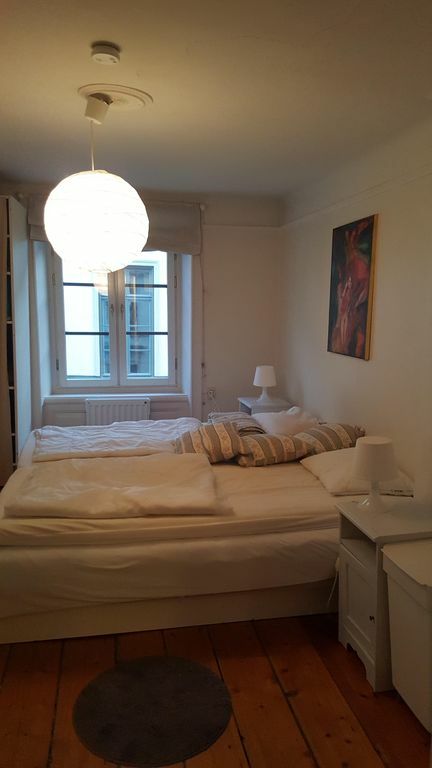 Excellent location for staying in the heart of Stockholm!! Cute one bedroom, one bathroom, living room, and kitchen. Located on the 3rd floor of a building built in the 1600’s. 3 minute walk to the metro and mini grocery store. Easy to walk to fabulous restaurants of all price ranges... $,$$, or $$$. We ate breakfast in the apartment and went to restaurants for lunch and dinner. Great location for shopping, walking the cobblestone streets, and catching the Hop On Hop Off Bus and Boat Tours which is a must!!!! Schöne Wohnung mit allem, was man braucht, nah zur U-Bahn und zum Schloss, mitten in der Altstadt. Sehr nette Vermieterin; wir durften das Domizil schon am Vormittag beziehen. Wir hatten eine tolle Zeit in Stockholm! Thank You for your kind words Katrin and for taking such good care of my apartment! Old town, the absolute city center of Stockholm. Du kommer til å leve i et hus fra 1700-tallet, beeing kan besøke lokale kirker, museeums eller bare vandre i de smukke gamlebyer. Head up to the royal castle, 5 min from the apartment. Changing of the guards is a nice way to see the castle and it's surroundings. Less then 5 minutes wal to the ferry that will take you to Djurgården with the Wasa and the ABBA museeum. Traveling with children? Why not go to Astrids Lindgren's world or Skansen? Heading in the other direction, you have city hall. Walk around where the Nobel Prize party is held, climb to the top and get a great view of Stockholm. Drottninggatan with all it's shopping opportunities is a short 10 min walk. The price is depending on the number of guests, 140Euro for 1 pers, +20Euro per extra person. Children under 2 years stay for free. Prices also vary per season. Please contact me for correct info.